Wood Pellet boilers are by far the simplest boiler type and fuel to live with, many installations being fully automated apart from the need to order fuel – and boilers can even prompt you by text to do this! This ease of use makes them ideal for domestic use and also commercial buildings such as offices and warehouses. Pellets are made from compressed biomass material such as waste saw dust from milling or from managed woodland specifically grown for the creation of wood fuels. Pellets are dry with a high energy content, individual pellets being cylindrical and between 10 to 30mm in length making them easy to handle in bagged or bulk deliveries. As with all biomass systems space is required for storage of the fuel, however pellets offer greater flexability than wood chip and logs. 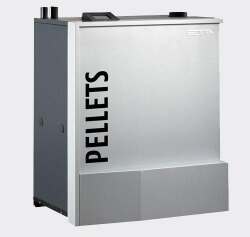 Having a high energy content and being compressed less space is required and with it being dry and small in size can be delivered from the fuel store by means of an auger or pneumatic vacuum, the latter increasing options for locating the store away from the boiler room.